…that Weir Farm located in Ridgefield and Wilton, Connecticut resulted from the trade of a painting and ten dollars. Erwin Davis, New York collector and friend to impressionist painter, printmaker, and teacher Julian Alden Weir, admired a European still-life in Weir’s personal collection and offered him an unusual deal—he would trade his 153-acre farm in Branchville for the painting and $10. Weir took possession of the property in 1882, and for the next 37 years he spent a portion of each year on the farm which eventually encompassed 238 acres. 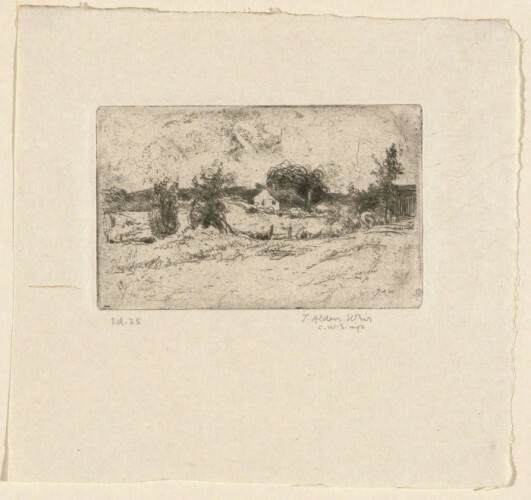 A member of the Cos Cob Art Colony, Weir established himself as a major Connecticut impressionist and visitors to the farm included such leading painters of the time as Emil Carlsen, Childe Hassam, Theodore Robinson, Albert Pinkham Ryder, John Singer Sargent, and John Henry Twachtman. Designated a National Historic Site in 1990, the 60-acre Weir Farm National Historic Site includes the Weir House, the studios of Weir and Young, the barns, gardens, and Weir Pond. It is presently Connecticut’s only National Park.